After exploring Nepal’s capital city, Kathmandu, and getting acquainted with the urban macaques, we decided to head south towards the jungle near the border of India. Tom and I enjoy the hustle and bustle of cities and all the culture and history that comes with it, but what we love most is being out in the wilderness. It was time to pay Nepal’s first national park a visit. Established in 1973, Chitwan National Park (चितवन राष्ट्रिय निकुञ्ज) was Nepal’s first national park. The park is located in the subtropical Terai region of southern Nepal and covers an area of 932 km^2 (360 sq mi). It is a world heritage property, and also contains the Ramsar site, Beeshazari Tal, in its buffer zone. A total of 68 species of mammals, 544 species of birds, 56 species of herpetofauna and 126 species of fish have been recorded in the park. The park is especially known for its one-horned rhinoceros (Rhinoceros unicornis), royal Bengal tiger (Panthera tigris tigris), and gharial crocodile (Gavialis gangeticus). We caught a bus from Kathmandu to Sauraha, a town just outside Chitwan National Park. We didn’t quite realise what an adventure that journey was going to be… Rickety old vehicles with no suspension on very rough roads, constant road works because of all the landslides and slips, vertical cliff edges both above and below us, buses and trucks over-taking each other on blind corners. It was a ride to be remembered, that’s for sure. From Sauraha, we were picked up by our hotel, Jungle Wildlife Camp. The staff were friendly and knowledgeable about the area. The views were great and, best of all, it was only a 2-minute walk down to the river. Our accommodation the night we arrived in Sauraha. The bees were also making themselves at home! Jungle Wildlife Camp – Our room with much needed mozzie nets! Of course, we have to include a shot of the all important food! That evening, we had a stroll through the township and alongside the river. 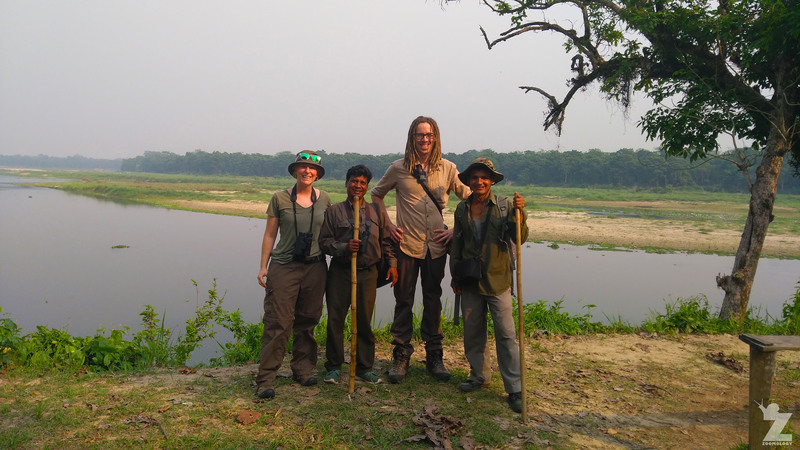 Without even entering the national park, we saw a young rhino charging through town, a sloth bear crossing the river in the distance, and several gharial resting on the water’s edge on the opposite bank. We couldn’t quite believe it! We’ll post a few of those pictures below, and the rest in our upcoming species-focused blog posts. Our entrance permits to Chitwan National Park: The guidelines. Briefed and ready to go, we made the 15 minute walk down to the river’s edge where our canoe was waiting to take us into Chitwan National Park. Tom, our two guides, the canoe punter and I headed down the river to where we would start our trek. It was a species-filled two-hour journey, and highly recommended if you are a birder or want to get a good view of the extremely rare gharial crocodiles. We landed the canoe, and continued on foot through the long elephant grass. The two-day trek took us through the national park the first day, and the Buffer Zone (which was just a great) the second day. We had many animal sightings and a few close encounters! For the first night of our trek, we stayed in accommodation just out of the national park in a small village. For the second night, we stayed in a 22-foot high tower in the jungle inside the Buffer Zone. The Jungle Tower stay was one of my favourite memories of the trip. Nothing can beat going to sleep and waking up with the sounds of the jungle. The dawn chorus of birds, insects and monkeys was bliss! We were even awoken by the sound of fighting rhinos right below us – we could see the footprints in the dust the next morning. Here’s a small sample of the species we came across during our trip in Chitwan National Park and the surrounding area. We took so many photos that it was hard to narrow them down! We will write dedicated blog posts for the gharial, rhinoceros and bird species we photographed. I will link to posts here as we publish them. This was a species we really didn’t expect to see in the flesh due to their extremely elusive lifestyle. Along the way, we saw plenty of sign that they were about: Claw marks in the trunks of trees (check out the height at which one tiger marked a tree – Tom is 6’3″ for reference), and fresh footprints in the sand. Then, much to our disbelief, we spotted a tiger walking on the opposite bank of the river and disappearing into the elephant grass. Tom managed to snap one shot (below) – proof that it wasn’t just a trick of the light! I did’t even have time to get my binos on it. We were absolutely stoked! This fella has a hitchhiker! Check out our gharial & marsh mugger crocodile blog post here. A cormorant with a catch! Tom (6’3″) standing beside a termite mound! After our dawn-chorus wake-up, we packed our gear and made the final trek back to civilisation. Our journey through Chitwan National Park was a fleeting, yet fabulous visit. Having knowledgeable and experienced guides definitely made the difference. Many thanks from both of us! Want to read about another of our jungle adventures? Hi Emma and Tom. What an AMAZING adventure! I’ve only done a really quick overview read and will be coming back later to properly appreciate the photos. But I can see its really awesome and I’m astounded you managed to get the Royal Bengal Tiger shot! Have re-visited and had a much better look through the photos. Thanks for dragging that heavy camera equipment around with you and getting these incredible photos of such a range of wildlife! Aw, thanks, Liz! We’re happy that we can share them with you. 🌿💕 Tom has almost finished writing the gharial post, so we’ll post that soon, too! It really was. 🌿 We wish we could’ve stayed longer! Hi Brian! We were pretty close to having to climb a tree actually. 😅 We were walking along the track when we spotted two rhinos to the side of us. Disturbed by our sudden appearance, they started jogging away but ended up on the same track as us. We could see the rhinos deliberating whether or not to run towards us, or just to take the perpendicular track. We inched towards suitable trees as silently as we could (if they charge at you, the aim is to always stay on the opposite side of the trunk because they can’t make sharp turns). Luckily for us, the rhinos chose not to have a face-off. Phew!!! An adventure it was indeed! What an absolutely astonishing place. I love that you give equal attention to so many aspects, the large and the small. I had never heard of a sloth bear before! Our planet is truly amazing and it is so sobering that so much is under threat. Thank you for sharing your experience and gorgeous photos. So many travelers’ tales of Nepal I have seen are about mountain trails and temples. You have opened my eyes to these other dimensions 🙂 P.S. So glad you supported a camp that doesn’t promote elephant riding. Thank you for your thoughtful comments, Carol. We are so happy that we could share our experiences with you. I really enjoy reading other people’s experiences of a place or an event, too, because we all see the world slightly differently. They may notice something that I might not have even considered! Hopefully yes. You both are doing such a good job with your beautiful and well constructed blog. Our fellow earthlings need all the help we can give, and more. What an amazing adventure! I think all your senses must have been hyperalert at any given time, considering all animal activity around you. Thank you for this excursion to a fabulous destination I likely will never set foot in.